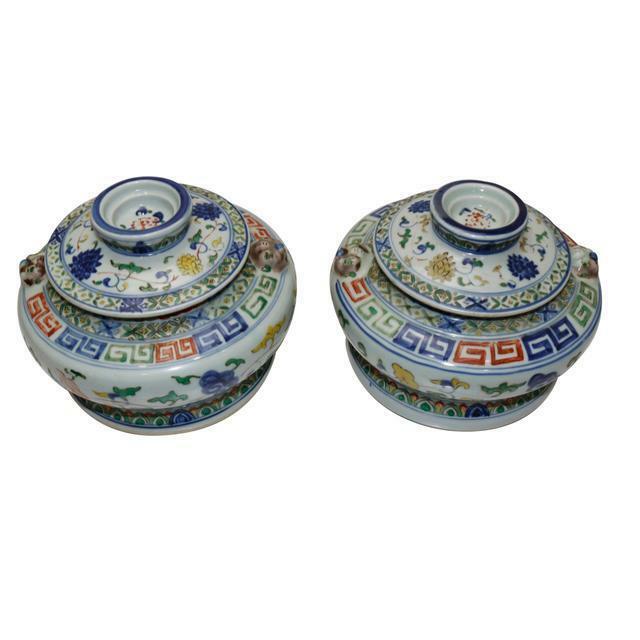 Bucket color porcelain, is the color as the main varieties of porcelain adornment gimmick, because of its decorative glaze green in color and glaze color appears as if trying to outshine each other at the same time the name. Is under glaze blue and white as a color green combined and a variety of color and glaze of porcelain decorative techniques. Bucket color porcelain picture in blue part with under glaze blue and white painted and white first, reoccupy after glaze firing glaze color material painted on the white part of the charging charred. 「Fight」 jingdezhen dialect means that several things merge together. Bucket color is to make several color combinations together techniques. Bucket color is a kind of glazes, have color of colored porcelain glaze. 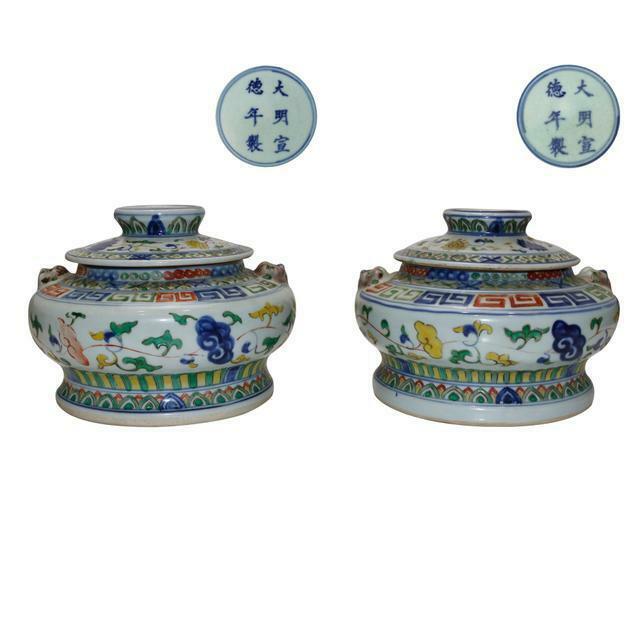 This shop you fight exotic flower of blue and white lines double lion first pot cover, the whole soil thin white porcelain womb, TaiZhi tightly structured. Full-bodied white glaze, enamel sleek brightening. Tank along with green ornamental design water lines for a week, with enamel bound branch flowers lines, concise and beautiful. 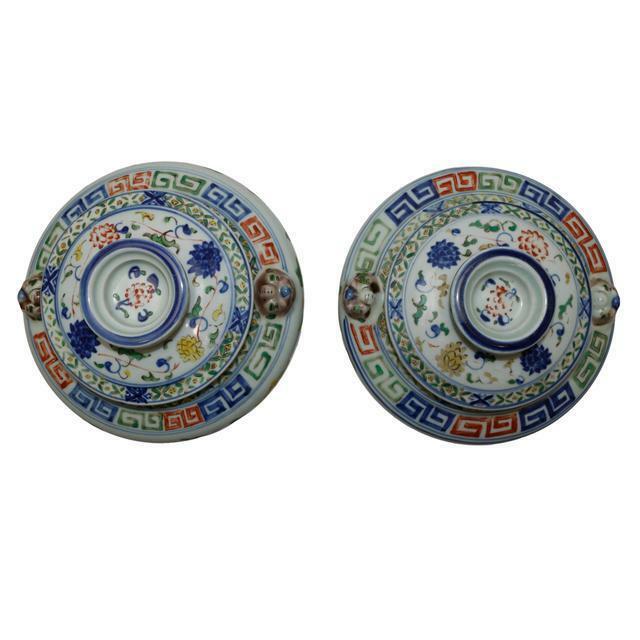 Coloured drawing or pattern stereo double lion carved on the canopy, intense eyes, the lion fluttering, stretched, powerful high-spirited; The phoenix breakdown curved neck, feather plump, gorgeous and elegant long tail. Outside the tank wall green Hualien pattern, modelling is vivid, unique brushwork. Outsole central double circle in blue book 「da Ming xuande years」 rigorous style. The overall picture. Complex and colorful, color noise, the characteristic of this period are amazing and has great value of collection.